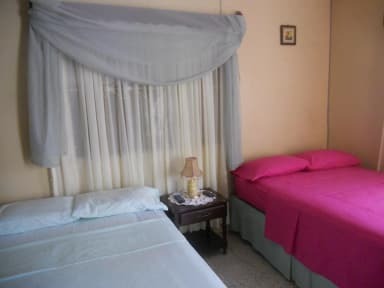 'Live Like a Local' is a typical family house in a quiet community on the outskirts of the resort town of Ocho Rios, five minutes away from the hustle and bustle of the town. Come idle awhile with the natives and be exposed to our intriguing culture, world class reggae music, beautiful and white sand beaches, visit world famous Dunn's River Falls or hike into the scenic Cockpit Country. 'Live Like a Local is offering one bedroom with own full bathroom and basic amenities. The room sleeps two but, has the capacity to sleep as many as four back-packers: each additional person after the first two persons will attract a cost of $15 USD each! !.